Each autumn, Russia’s GRU secret service celebrates its birthday. Falling on Nov. 5, the festival is officially called the Day of the Military Intelligence Agent and commemorates the founding of the Soviet military intelligence service in 1918. At the GRU headquarters, a modern, functional building located in northwest Moscow, the defense minister gives an inspiring speech, followed by medals for deserving employees. This year, though — on the GRU’s 100th birthday — the mood is far from cheerful. Instead of a party atmosphere at headquarters, the Defense Ministry held a crisis meeting instead. And it was apparently open season on the GRU. “Complete incompetence” and “unbridled sloppiness” were a couple of the accusations leveled at the agency, one journalist learned, and a jokester apparently even asked why GRU agents abroad “don’t just put on budenovkas?” Budenovka is the name of the striking pointed caps adorned with the Soviet star that members of the Red Army began wearing in 1918. At the moment, Russia’s military intelligence service is having trouble staying out of the headlines. That in itself is a sign of crisis, given that spies generally prefer to keep themselves out of the news. Until recently, only a handful of people abroad even knew what the abbreviation GRU stood for: Main Intelligence Directorate. For most people, Russian intelligence was synonymous with the domestic FSB intelligence agency once headed by Vladimir Putin. That, though, has recently changed, with new details about the GRU emerging on a regular basis in recent weeks. Whether it’s the poison attack on ex-double agent Sergei Skripal in Salisbury, Britain, or a cyberattack in The Hague, the exposing of coup plans in the Balkans or the hacking of anti-doping agencies, of the U.S. presidential campaign, of the German federal parliament’s computer network or of the Malaysian public prosecutor’s office investigating the shooting down of an airplane over Ukraine, the GRU has been leaving its tracks everywhere. The series of blunders is surprising. But so too is the fact that this intelligence service has become so ubiquitous. Is it still even a military secret service or has it morphed into something bigger? And if so, how did GRU get there? Until recently, the GRU had been regarded as professional, if not particularly squeamish. But the latest news — such as the March 4 attack in which ex-agent Skripal was supposed to be killed in Salisbury using a neurotoxin — has cast the agency in a different light. Two men suspected by the British in the incident claimed on Russian television that they had been nothing more than harmless tourists. The performance was ridiculously implausible, and it didn’t take long for it to be refuted. The investigative journalism platform Bellingcat recently revealed that both are high-ranking GRU officers and recipients of Russia’s highest government award, the “Hero of the Russian Confederation.” The site identified the men traveling under the aliases Ruslan Boshirov and Alexander Petrov as Anatoliy Chepiga and Alexander Mishkin. Another clumsy operation also ensued in The Hague only one month after Salisbury. Four GRU employees attracted the attention of Dutch intelligence agents when they tried to hack the computer network of the Organization for the Prohibition of Chemical Weapons from a parking lot. The four had entered the country with diplomatic passports and had been picked up at the airport by an embassy employee. Their computer still carried traces of an attack on an anti-doping conference. Soldatov describes the story as “a nightmare,” adding that it is far more bizarre than the action in Salisbury. How, he asks himself, can a secret service act in such a dumb way? And what is going on in the heads of military officers who are sent to attack sports organizations rather than military targets? To answer these questions, one has to look at the GRU’s past. Since the dismantling of the Soviet Union’s once all-purpose KGB, Russia has been home to a broad palette of intelligence agencies. The KGB’s First Chief Directorate became the Foreign Intelligence Service of the Russian Federation. The agency is regarded as chic and elegant, and it is located “in the forest,” as its shielded headquarters are referred to in agent jargon. The KGB’s Ninth Chief Directorate became the Federal Protective Service (FSO), which is responsible for providing protection to Putin and the Kremlin. The agency is feared primarily because proximity to Putin is synonymous with power in the country. The rest of the KGB became the Federal Security Service (FSB), the domestic intelligence agency. It’s the best-known agency and it also took over KGB headquarters at Lubyanka Square. Unfortunately, it also adopted some of the Soviet secret polices’ methods. What makes the GRU so special is the fact that it is the only intelligence agency that has nothing to do with the former KGB and its legacy. It was and still is subordinate to the General Staff of the Armed Forces of the Russian Federation. It even possesses what amounts to its own army. The GRU’s Spetsnaz brigades are elite troops trained for action in enemy territory. They also serve to attract new agents. Those who prove themselves in the GRU’s Spetsnaz military service stand good chances of advancement within the apparatus. This is why typical GRU agents differ from their civilian counterparts in the SWR foreign intelligence service. Broadly speaking, they typically aren’t sharp analysts with good manners, but social climbers who lack finesse. Though they know how to bury an explosive device and feel more comfortable under enemy fire than in a provincial part of England. At first glance, the two Salisbury suspects, GRU officers Chepiga and Mishkin, seem to fit that mold. Both of them have traveled an impressive path from remote villages on Russia’s fringe to the officers’ clubs in the capital. 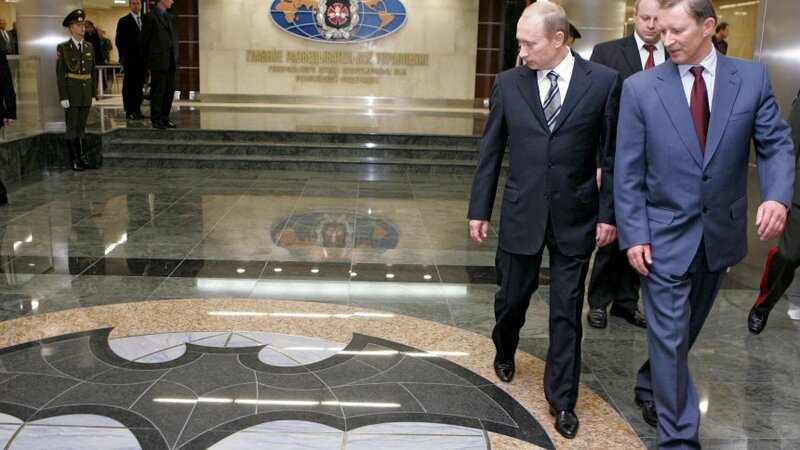 It’s perhaps no coincidence that GRU also had its power symbolically curbed at the time. The traditional abbreviation was shortened to GU — from the “Main Intelligence Directorate” to the “Main Directorate” of the General Staff of the Armed Forces of the Russian Federation, even though the old designation has been retained in everyday usage. Meanwhile, the bat in the organization’s original coat of arms, which some GRU veterans proudly wear as tatoos, was replaced by a carnation. “They don’t like Putin at the GRU,” says Sergei Kanev, a prominent investigative journalist in Moscow. Kanev’s reporting helped shed light on GRU activities in Salisbury. He helped expose supposed tourist Ruslan Boshirov as GRU Colonel Anatoliy Chepiga and also discovered that officials at the Defense Ministry are furious at the GRU right now. “There were angry people at the weekend meeting,” he says, adding that he learned about the atmosphere there from a reliable source. If Kanev’s source can be believed, then President Putin already summoned GRU head Colonel General Igor Korobov to a meeting back in mid-September for a dressing down. Korobov is said to have collapsed at home afterward. Kanev explains all this by way of video chat because he had to flee Moscow for the Baltic states. A friend had warned Kanev that he was likely to be taken to court in Russia. Kanev works for a journalism project financed by exiled businessman Mikhail Khodorkovsky and has never shied away from controversial issues. Most recently, he conducted reporting on the Wagner Group, a private Russian military force that is led by a former GRU officer and conducts its training at a GRU base in southern Russia. The man considered to be at the helm of the group is an entrepreneur from Putin’s circle in his home city St. Petersburg. Kanev doesn’t consider the strange secret service failures in recent years to be a problem specific to GRU. “The whole state system is being degraded,” he says. If officials in Russia sell access to the country’s passport database, which is likely what made the reporting in the Skripal case possible in the first place, then why should military intelligence be an exception? Based on the number of times the agency has been caught red handed recently, it seems safe to assume that the GRU has recently expanded its remit. That expansion is tied to a remarkable turnaround at the agency that began in 2012. That year, Defense Minister Serdyukov was replaced by Sergei Shoigu, one of the most powerful and ambitious men from the president’s inner circle — and a frequent companion on Putin’s outdoorsy vacations. Shoigu partially reversed the military reforms of his predecessor while increasing the army’s prestige and opening up new resources and recruiting possibilities. Under his leadership, the army in 2013 announced its “big hunt for programmers,” recruited students from universities and began bankrolling hacking competitions. The GRU also profited from these developments. Shoigu even handed back the Spetsnaz brigades to the GRU. But the agency benefited even more from the radical shift in Russia’s foreign policy since the Ukraine crisis. In 2014, GRU troops in unmarked uniforms were on the ground during the annexation of Crimea and fought against Ukrainian troops in the Donbass region. That was also when the two suspects in the Salisbury case received their medals, which were awarded by Putin himself. In 2015, GRU prepared the Russian military intervention in Syria. Officials at the Kremlin were satisfied with the result. In 2016, for example, the GRU had become so active that the agency and its head, Korobov, were slapped with sanctions by the U.S. Treasury Department before the end of the year. In April 2016, the organization hacked the computers of the Democratic National Committee and of Hillary Clinton’s presidential election campaign, something that a competing Russian intelligence service had also succeeded in doing. But GRU went well beyond hacking — the agency also saw to it that the emails were ultimately made public. The fact that the GRU, and not other hackers, was the source of the emails that found their way into the public light is confirmed in U.S. special counsel Robert Mueller’s indictment. After a year of investigating (and shortly before the summit between Trump and Putin in Helsinki in July), Mueller’s indictment listed the names of 12 officers in charge of the operation. The question is how Vladimir Putin sees all this — whether he wants to continue using the GRU to pursue unconventional objectives or whether he has now come to regret the idea. The recent mishaps aren’t the first for the agency. In 2004, Russian secret service agents, presumably with the GRU, killed Chechen separatist leader Zelimkhan Yandarbiyev in Qatar. But the agents’ identities were ultimately exposed, resulting in their arrest. It didn’t do any damage to the agency at the time. Soldatov says everything hinges on the defense minister. In contrast to FSB and SVR, GRU doesn’t report directly to the president, but rather to the General Staff and the defense minister. And given that Putin has so far been very pleased with ambitious Shoigu, it may well be that the GRU’s stumbling won’t hurt it this time, either.